uiForm – Universal Cost Estimator is a form builder script which can estimate website design or any service for your clients. it automatically generates an invoice. You can proceed checkout using payment gateway. it can be integrated into wordpress, joomla, magento, Woo commerce, drupal, opencart and any site. All through a widget code which is generated by the application. Also it provides an administration section where site admins can create custom forms, fields, custom skin, manage layout fields and all kind of editing operations. It’s really easy to customize and you don’t need programming skills. 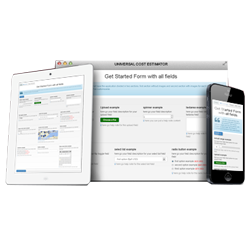 Estimate forms can be turned into invoice, then clients can checkout through payment gateway. Customizable text, background color, font size, font color of each field. Upload unlimited images for each field. Dinamic Popup Tip Content for each field.